IT’S a murky form of modern-day piracy that has netted millions for its practitioners. But it’s not treasure that has enticed these 21st century Spanish brigands. It’s fish. The hunt for the precious omega 3-rich Patagonian toothfish – known as ‘white gold’ – can yield an incredible €73 million in a single season’s haul. Described by celebrated food critic AA Gill as the ‘most utterly delicious fish’, it is understandably big business, but also highly illegal, akin to hunting the critically endangered rhino or gorilla. So critical has become its protection that only tiny shoals are left and figures such as Prince Charles have helped to launch campaigns to protect them. And despite thousands of restaurants around the world refusing to serve it up, industrial scale fishing somehow still continues… and its worse culprits are a Galician gang, that thankfully has been finally snared after a decade of evading justice. The detention of six members of the Vidal family after an investigation by Interpol and Spanish police was greeted with delight by environmentalists around the world this month. Fishing baron Antonio Vidal ‘Tono’ Pego and his father Antonio Vidal ‘Tucho el Coyo’ Suárez have been doggedly pursued across the seven seas by Sea Shepherd, a brave, little known marine wildlife conservation group. Indeed, it was largely thanks to the bravery of one of its sailors, Captain Siddharth Chakravarty that these two pirates were finally brought to justice. A 110-day chase of the Vidal supership Thunder by Chakravarty, last year, became the longest in maritime history. “For years, the Vidal crime syndicate have destroyed the vulnerable toothfish populations in the shadowlands of Antarctica, using the blurriness in international law to hide their involvement,” Chakravarty told the Olive Press from the South China Sea, this week. The Spanish high court has said the family form a ‘criminal organisation’ and they have hit the Vidals with €17.84m in fines. 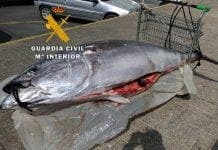 This sad tragic story has its roots in the insatiable Spanish desire for fish. In 2013, Spaniards devoured more than 26kg of fish, behind only Portugal in Europe and close to Japanese levels of consumption. And their enormous appetite for fish shows no signs of stopping, with this month plans being unveiled for a controversial 65-hectare site near Zamora which would house the ‘biggest farmed salmon factory in the world’. Meanwhile, Galicia accounts for 50% of Spain’s fishing industry, with overnight lorries transporting fish hundreds of miles from Vigo to Mercamadrid, the world’s second largest fish market. As Spanish stocks have depleted, its fishermen have been forced further out to sea. But Galicia’s misty docks also have a long association with nautical skulduggery. During the 1980s the local criminal fraternity, capitalising on the area’s links to South America (forged when poverty-struck Galicians were forced to emigrate) turned the coastal area into one of the main portals for Europe’s drug trade. Antonio Vidal Suárez was born in 1952 with the region’s cold Atlantic brine flowing through his veins. 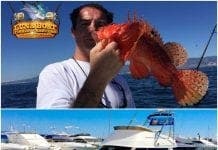 Raised in Riviera, Spain’s most important inland fishing port, he learned his trade from his father, a local shipowner. When his father died, Antonio set up his own trawler company. His son Antonio, Tono, a highly-intelligent man with a business degree and fluent in English, became his trusted right-hand man in their company Ribeiro Vidal Armadores. The company operated local trawlers and although things went swimmingly to start with things got tougher for Galicia’s fishermen after Spain joined the European Union in 1986, when already depleted fish stocks were finally protected by the imposition of fishing quotas. This was bad news for the Vidals. Realising the family business needed to expand or die, they teamed up with Antonio Perez, a fellow Riviera fisherman who had worked in the lucrative toothfish industry off the coast of Argentina. “If you go back to the 80s and 90s off the Falklands, Spain has always had a hand in the toothfish industry,” Captain Chakravarty told the Olive Press from his boat, currently in the South China Seas, chasing a band of illegal shark fisherman. With toothfish in plentiful supply in French waters in the Southern Ocean, Vidal went into partnership with a French company to exploit them. However the lucrative business eventually soured at the hands of the authorities, which is when the Vidals opted to go out on their own, completely illegally. “I am not a pirate,” said Suarez when confronted about his actions by a journalist a few years ago. “Legal fishermen can say whatever they like and accuse whomever they want. To conservationists, however, their form of fishing was a blight on the ocean, with toothfish more susceptible to intensive fishing as they take longer to mature. Originally popular in Russia and Ukraine only, by the 1990s toothfish become fashionable in the USA and Asia. New York’s Four Seasons hotel put it on the menu, with one fish alone fetching up to €885. By now, the delicacy was cleverly rebranded as Chilean sea bass. But as its popularity grew, overfishing made toothfish an endangered species. Not that this mattered to the Vidals, who didn’t accept the illegality of their actions. Their refusal to bow to maritime law reached an astonishing head in 2003. 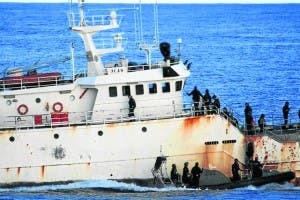 Between August 7 and 28 one of Vidal’s boats, the Viarsa, was pursued 4,000 miles across the Southern Ocean by Australian patrol boat Southern Supporter. It was one of the longest chases in maritime history. With Perez at the Viarsa’s helm, the ship veered straight into a monstrous storm and had to change course for Antarctica. Huge waves threatened to rip the Viarsa to pieces but Perez was not about to surrender his €900,000 cargo of toothfish without a chase. Despite 75-mph winds and narrowly avoiding some 70 icebergs, Perez led his 41-strong crew on a kamikaze journey. Finally, the Viarsa was cornered in the South Atlantic Ocean as ships from Britain and South Africa joined the pursuit. But to the anger of all three countries, Perez and his crew walked free from charges of illegal fishing in an Australian court due to a lack of evidence. Back in Riviera, the Vidals celebrated their release with a firework display and, no doubt, lots of fine Albarino wine. However, the family were soon in trouble again. In May 2004, Tono Vidal attempted to import 53 tonnes of toothfish into Miami. Using fake documents and working through a Uruguayan-based company, Fadilur, Tono hoped to sell the fish on the American market. But when the false documents were uncovered by US agents, Interpol issued an arrest warrant. Desperate, Tono reached out to the FBI to strike a deal. The Spaniard avoided 20 years in prison by agreeing to inform on other tooth fishermen. 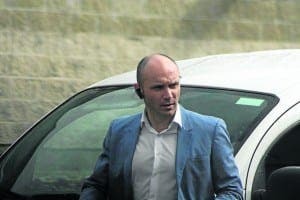 Pleading guilty, he received a €357,000 fine and four years’ probation, the first Spanish pirate convicted in the USA. International pressure began to grow on the Vidal clan. Greenpeace lobbied Zapatero’s then socialist government to move against the family’s operations. But nothing was done and in 2011, Greenpeace produced a leaflet called Tono, which accused the government of protecting him. “Spain not only hasn’t acted against him, despite receiving international pressure, it has supported him,” said a spokesperson. Incredibly, the government had even gone the other way, actually supporting the Galician gangsters. 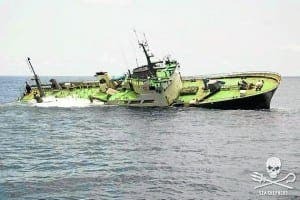 Greenpeace estimated that Vidal Armadores had received €16 million in grants from the government and the Galician Junta. Commentators estimated backhanders. But the net was closing on the Vidal crew. In 2015, Spanish police and Interpol launched Operation Sparrow to snare the family. Spain’s agriculture ministry also levied €15 million fines against three of Vidal’s boats. In February 2016, one of these, the Kunlun, attempted to offload its illegal haul of toothfish in Senegal while sailing under a false name. Its crew was arrested. Altogether, three of Vidal’s ships have been successfully pursued by Sea Shepherd. The culmination of the operation was the arrest this month of Tono and Tucho el Coyo, plus brothers and sisters Angel, Belen and her husband Joaquín Manuel Pérez. “We haven’t seen the details of the charges yet, but these are now criminal proceedings and could lead to jail sentences, not just fines,” says Elvira Jiménez, the head of Greenpeace Spain’s oceans campaign. Spain’s most notorious pirate family could finally have been sunk. Now they will appeal, and the case will likely drag on for decades. The problem with over-fishing is over-eating. The Spanish consume the most seafood in Europe. Stop that, and you’ll stop the extinction. In the interest of fair reporting, I want to make the following statement. I’m 100% opposed to illegal fishing and overfishing, but to say that catching Patagonian Toothfish is illegal is an incorrect statement, akin to saying Alaskan King Crab is illegal. 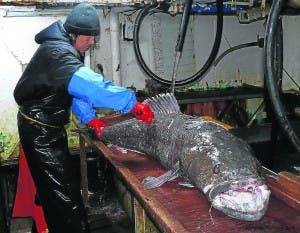 The Patagonian Toothfish population, aka Chilean Sea Bass, is closely monitored, with a set quota each year. The illegal aspect outlined in the article relates to fishing vessels operating illegally, without a legal quota for their catch. I’m in complete support of all efforts, both governmental and NGOs, to curb illegal fishing. My only request is that the facts are clearly stated to not undermine the arguments presented in the article. 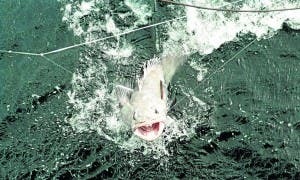 The article refers to illegal Patagonian tooth fish fisheries as specified by the Commission for the Conservation of Antarctic Marine Living Resources (CCAMLR), Marine Stewardship Council (MSC) who over fish, use bottom scraping gill nets to collect everything and certain kinds of multiple hook longlines that ensnare birds going after the bait as the lines are let out. Since there are several non-endangered species with nearly identical taste and texture characteristics, there really is no reason to be fishing these to the edge of extinction. Its a bit like like those who like the thrill of eating forbidden game meat. To eat fish is very healthy but we, the Spaniards, must stop fishing in the sea and grow fishes in farms. Farmed salmon in Spain are light colored and fatty, probably meal fed with antibiotics. Light color and mushy flesh indicates poor farming conditions. Fish need to be farmed in deep cold waters and large, deep pens for exercise like the Scots do to be fit for human consumption. Farmed fish are fed on other ground-up fish. The ones we turn our noses up at, but still scooped from the oceans willy nilly. The crazy thing is, it takes something like four times the weight of those unwanted tiddlers and uglies to produce one unit of farmed fish. So called ‘junk-fish’ are taken from South American coastal waters, putting pressure on ocean protein sources in those countries. Farmed salmon labels list these ingredients: Poultry Meal, Fish Meal, Poultry Fat, Fish Oil, Whole Wheat, Soybean Meal, Corn Gluten Meal, Feather Meal, Rapeseed Oil. The higher fat content allows the absorption of more pollutants such as carcinogenic PCBs. The only alterrnative to the depletion of the fish reserves in the oceans is the fish farming. 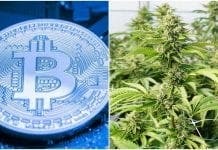 As, long time ago, the alternative to the gaterirng of fruits was the horticulture and the alternative to the hunt of animals were the cattle ranching.
. We have no option. Do you haven´t seen the movie “Soylent Green”. Scottish fish farms are correctly constructed, inspected, regulated, and managed. I can’t imagine Spanish ones would raise disease free fish given what is currently in markets and corrupt administrative practices.